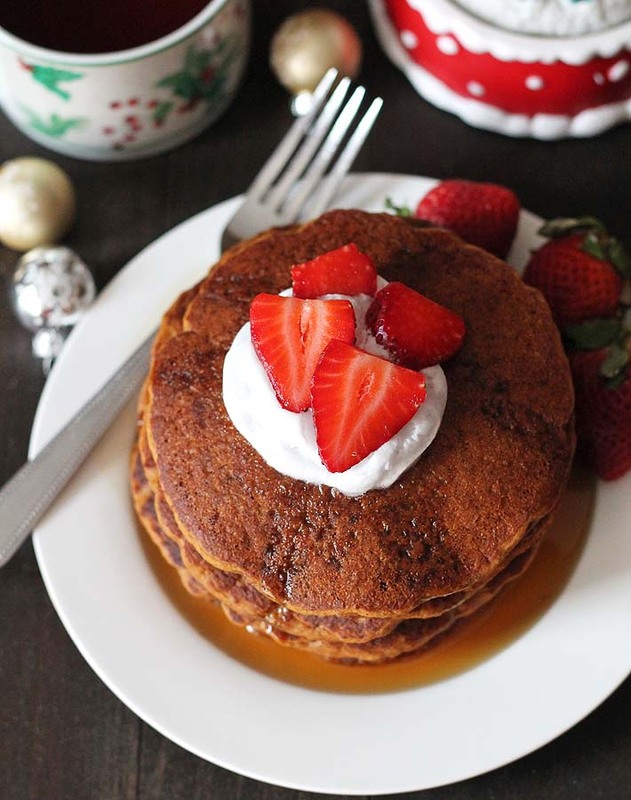 Easy and fluffy Vegan Gingerbread Pancakes that are perfectly spiced and make a festive addition to your holiday table (they’re also great to enjoy-round!). They can also be made vegan AND gluten-free, full details below! 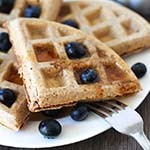 Christmas morning breakfast in my home always includes my vegan gluten free gingerbread waffles. 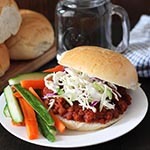 It became a fast favourite of ours after I came up with the recipe a few years ago. It’s such a fave, that I sometimes make them outside of the holiday season (it’s totally OK to have gingerbread waffles in July, right?!). 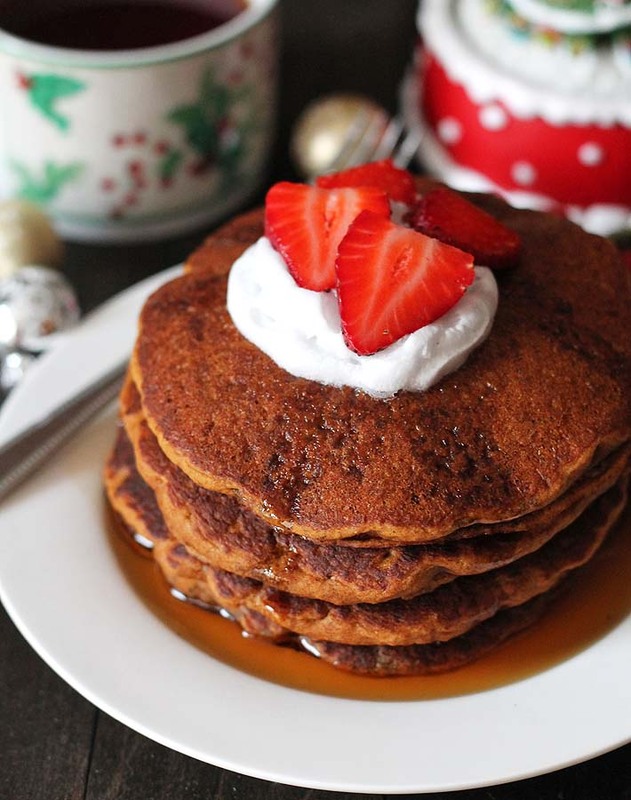 This year, those waffles have a rival: fluffy vegan gingerbread pancakes. For this recipe, I went back to that gingerbread waffle recipe mentioned above and adjusted it slightly to turn them into delicious gingerbread pancakes. 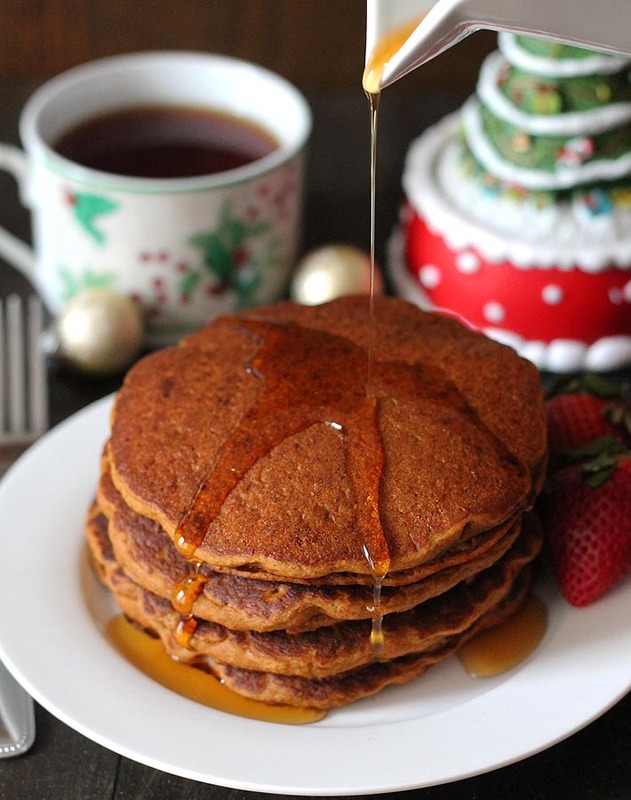 If you’re gluten free, you can also make them gluten free gingerbread pancakes. 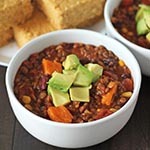 I’ve included instructions on how to make a vegan-only version and a vegan gluten free version. As mentioned above, I tested a non gluten free version for you with all purpose flour. It’s perfect now, but it took me a while to get it to where I was happy to share it. I don’t usually make pancakes that are not gluten-free, so I had a little bit of a learning curve. With this recipe, it was not a straight cup for cup substitution for the gluten free flour, like with my baked doughnut recipes. The all purpose flour did not absorb the liquids as fully as the gluten free flour did, in this case, so I had to play around with measurements a bit. BUT, I’m happy to say that it’s now perfected. My family ate a whole lot of gingerbread pancakes over the past few weeks as a result of all the testing, and they’re still not sick of them. Both versions are fluffy (just the way pancakes should be!) and packed with warm, holiday gingerbread spiciness. 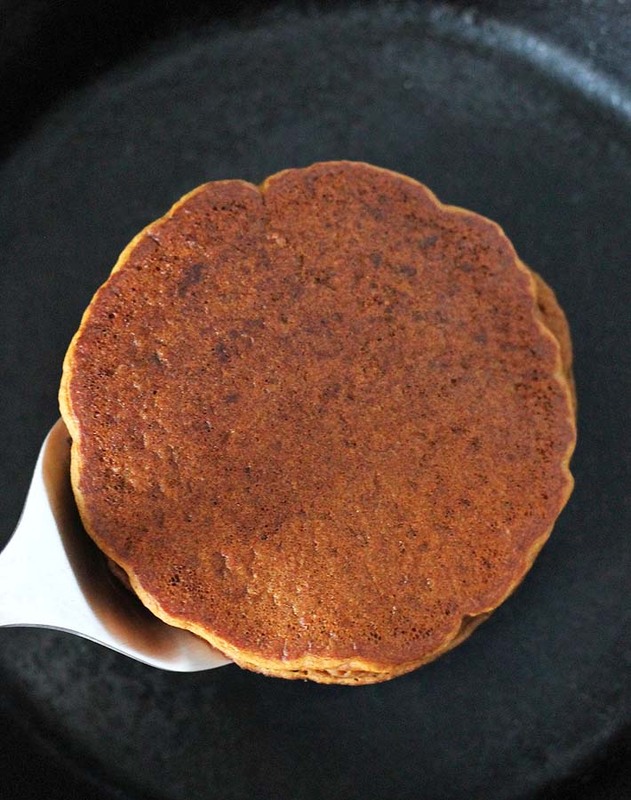 And the gluten free gingerbread pancake version? If you make them the way the recipe is written and you use the same gluten free flour I did, no one would be able to tell they’re gluten-free. 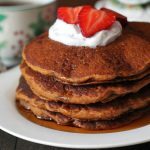 Recipes like my vegan gluten free gingerbread chocolate chip muffins and my vegan gluten free gingerbread loaf are must-makes during the holidays, and now I have my vegan gingerbread pancakes to add to that list! You can top your pancakes any way you like. Pure maple syrup is my go-to, but here, I also added coconut whipped cream and sliced fresh strawberries, and it was perfection. 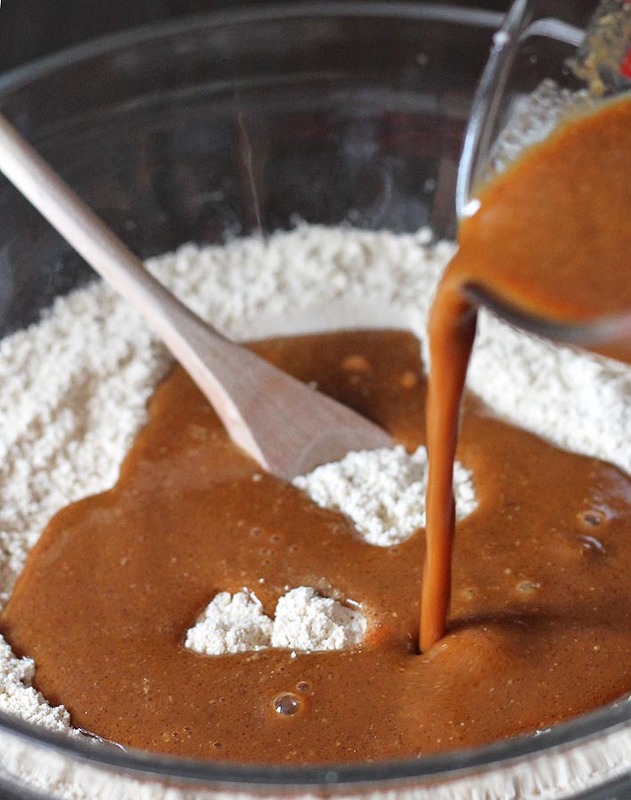 You can also use maple caramel sauce instead of maple syrup, or you can use chocolate sauce (I love gingerbread and chocolate together!). It all depends on how much sweet you like. If you don’t like too much sweet, you can’t go wrong with the fresh berries and coconut whipped cream. No matter how you top them, they’ll be delicious. Play around with different combos, and see which you like best! I’d love to see your remakes! And click here for more vegan gluten free holiday recipes! I’m making the vegan gluten free version in the video, if you make the non gluten free version, your batter will be slightly thicker. Whisk non-dairy milk, coconut oil, pumpkin puree, molasses, and ground flax seeds together in a medium-sized bowl, whisking enough to incorporate the flax seeds. Let sit for 5-minutes. Whisk flour, baking powder, baking soda, ground ginger, cinnamon, allspice, ground cloves, and salt together in a large bowl. Slowly add wet ingredients to the dry ingredients, mixing well until incorporated. If the batter seems a little too thick, add a little more non-dairy milk, 2 tablespoons at a time. Lightly coat surface of pan with a very small amount of oil. Ladle about 1/3 cup (or less for smaller pancakes) of the pancake mixture into the center your pan, cooking 1 at a time. Continue cooking until the batter is done, placing pancakes on a covered oven-safe plate in the oven as they finish to keep them warm. It's important to know that all gluten-free flour blends use different ingredients and ratios, so results will always vary when you use different brands. I have never used any other brand of flour to make these pancakes (other than Bob's Red Mill), so please know that your results may not be the same as mine if you substitute with a different flour. Coconut flour will NOT work in this recipe. This recipe makes 8-10 pancakes, depending on how large or small you make them. When I make my pancakes, I use a thick, cast-iron pan. I usually turn mine after about a minute. Some experimentation may be necessary until you get a feel for it. Everyone's griddle/pan will cook differently. Because this recipe contains molasses, the pancakes can burn easily, so keep a close eye on your pancakes as they cook. 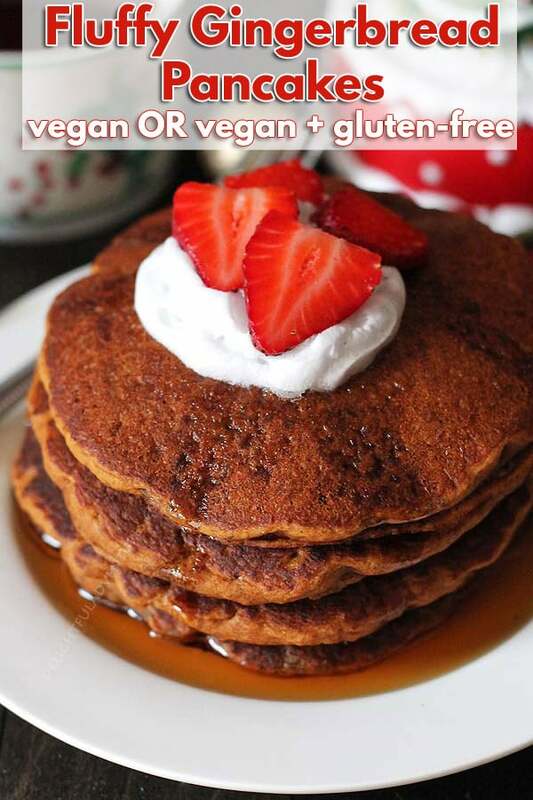 Nutrition info listed below is for 1 of 8 vegan gluten free pancakes, without toppings and using unsweetened almond milk (calorie count for 1 vegan pancake is 181 calories). Nutrition info is to only be used as a rough guide. Click here for more info on how nutrition info on this website is determined. Liberties are totally fine, as long as you know what you are doing 🙂 Glad you were able to use it as a guide and that you like it!